Interior design is more than decorating a room. It is about collaboration, craftsmanship and personalization. JF Interiors, Inc. is not about "a look" but about offering tools to our clients in order to express themselves. Rozalynn Woods Interior Design is recognized for a clean and sophisticated sense of style that seamlessly integrates Interior Design and Architecture. Rozalynn’s design philosophy fuses history and modernity through a reﬁned and luxurious mixture of colors, textures and furnishings. With 25 years of design experience, Rozalynn insures her spaces present a current point of view, yet appear timeless–each pertaining to her clients' unique sensibility. Every project is an opportunity to create an environment that fuses high style with comfort, and incorporate an element of the unexpected. As an inveterate world traveler with a passion for ﬂea markets and furniture history, Rozalynn draws from those experiences and incorporates them into an extensive number of projects whether in Pasadena, NYC or Montreal. Rozalynn has participated in several Pasadena Showcase Houses of Design and ASID Home and Kitchen tours. Her work has been published in California Homes, Metropolitan Home, California Home and Design, Pasadena Magazine, Spectacular Homes of Southern California and The Sunset Garden Style Decorating Book. 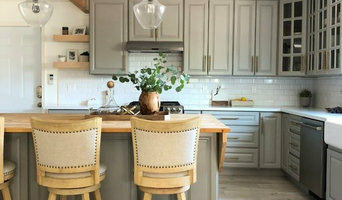 Her designs have received extensive newspaper and blog coverage, and have been featured on HGTV. She was recently awarded “Best Interior Designer” by Pasadena Weekly. 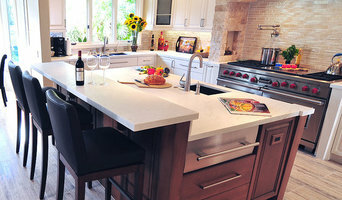 Hello to all you wonderful clients and potential clients - we are no longer posting newest photos on our Houzz profile. Please find our latest work on our website, www.robertamartininteriors.com, on Facebook and on Instagram. We look forward to hearing from you as ALL projects are interesting to us. The best way to contact us is to e-mail at roberta@robertamartininteriors.com. Thank you so much. Meanwhile let us know of your dreams! We'll make them a reality! We have many years of experience designing so that your space can be what you've always dreamed and most likely better! We specialize in designing gourmet kitchens and spa baths for clients that want beauty and function in a personalized environment. We collaborate with you for your needs and wants as our priority to give you the custom gourmet kitchen and spa retreat that you are looking for. You want solutions to your problems. We give you those solutions. Imagine your unique requirements coming to life in your home! Now you can have them! Contact us to discuss your dreams! We will put them to life for you! Design fees depend upon the size of your project. Tell us about your project. Once we have had a chance to discuss on the phone for about 30 min, next is the design consultation. This is for up to 2 hours at an investment of $600. We always have many design ideas which may surprise you! You can use these ideas should you decide not to work with us. However we have been told we are flexible and easy to work with! Should you want to meet to get to know each other first, we can have what is called a meet and greet which is at no charge. We will meet at a neutral location for 30 minutes to see if we would like to move forward together. A design consultation is always required at some point, however. Once we see your project and understand your dreams, we will put together a proposal with our design fees. Every project is so very different, it is not possible to give a fee without understanding your individual project. We look forward to hearing from you to answer questions and get your project started! Regarding the list of services below, Houzz does not allow us to check all the boxes below and we cover all of those services so we left all blank!. Thank you and look forward to hearing from you! A good home design professional will hone your style down to its very essence and be able to choose a functional layout that feels natural to you. Interior design companies can be involved as much or as little as the client desires. Many clients who hire an interior decorator in Arcadia, CA — particularly those who are remodeling — have a good sense of how the room should look and what products they should use. Often clients will insist that interior decorators use the products already present in the house. Other times a designer will need to start from scratch — especially if this is a newly purchased or just-built home. An interior design company will need to figure out exactly what the client needs, which includes organizing rooms, picking flooring and wall colors, and finding furniture to complement it all. Sometimes that means he or she will have to recruit help from other Arcadia, CA home professionals to help create the perfect look for your renovation. Here are some related professionals and vendors to complement the work of interior decorators: . Do your research before meeting with an interior designer or home decorator in Arcadia, CA. Ask yourself what you want your space to become and what it will be used for. Figure out the extent of what you need help with, what your must-haves are and what your budget is. Interior design services can add up fast, so be up front with a potential design firm or individual from the beginning. Also, pick an interior decorator that fits your style. Browse through the portfolios of different Arcadia interior design firms and decide if you would live in those houses. Just because you like something doesn’t mean you could live in it. There's a big difference! Find an interior designer or home decorator in Arcadia, CA on Houzz. Narrow your search in the Professionals section to find Arcadia interior designers near you. You can also look through Arcadia, CA photos to find a room you like, then contact the design firm who designed it.